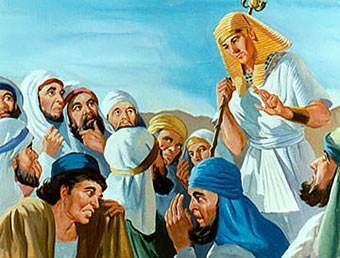 Joseph lived in Egypt. Joseph was far away from his home. He was far away from his father and from his brothers. It was a long time since the men on camels had brought him to Egypt. Then he was a boy. Now he was a man. He was a good man and loved God. The king saw how Joseph loved God and he made him his helper. 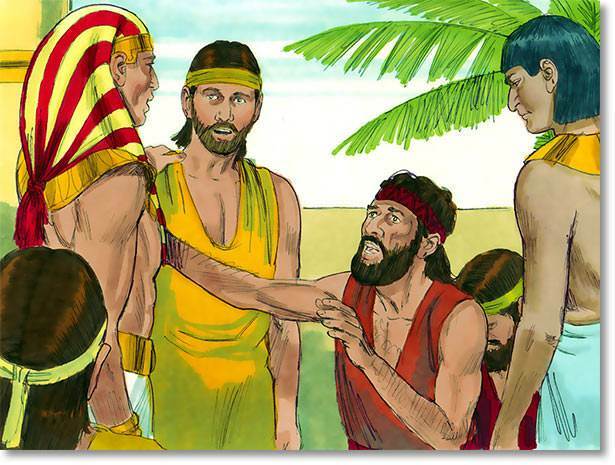 The king had Joseph dressed in fine clothes, and put a ring on his finger, and a gold chain about his neck. 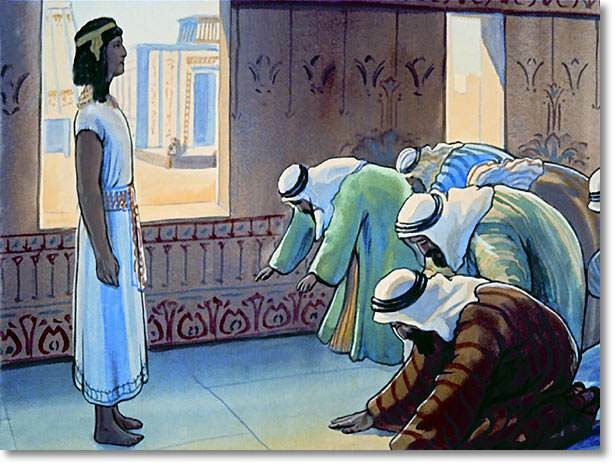 Joseph helped the king by storing away in big houses all the grain that the people could not eat. Then came a time when no grain would grow. The people were hungry. 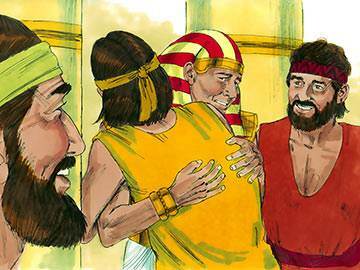 They came to Joseph and he sold them grain from the big houses that he had filled with it. 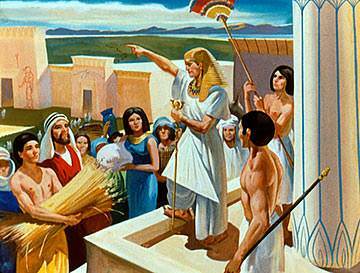 No grain would grow at the home of Jacob, Joseph's father. Jacob said to his sons: "Why do you look so unhappy? 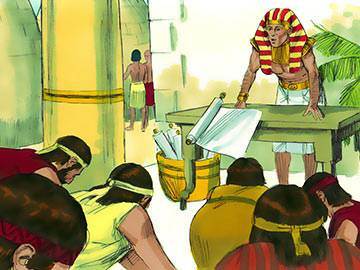 Go to Egypt and buy grain, that we may not be hungry." 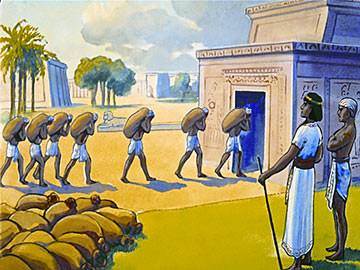 So all Jacob's sons except Benjamin went to Egypt to buy grain. Jacob could not bear to send Benjamin. He was the youngest. Jacob was afraid some harm would come to him. 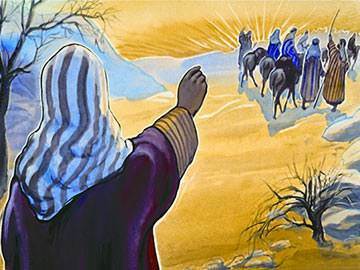 The ten men came to Joseph. They bowed their heads low before him, for he was a great man. He looked at them closely, He knew them. They were his brothers. But they did not once think that the King's helper who sold them grain was their brother Joseph. Joseph said to them, "Is your father alive? Have you another brother?" They said, "Benjamin is at home with his father." Joseph acted cross. He made them think he did not believe them. He shut up one of the brothers and said,"I will keep this man shut up until you go home and bring back your youngest brother Benjamin. If you bring him back, I shall believe you are telling the truth." They said to each other, "This serves us right. We would not listen to our brother Joseph when he cried for help. Now we must suffer." They did not know that the great man before them was their brother Joseph, and that he understood all they said, and only pretended that he was cross. They went home and got Benjamin, the youngest one. They brought him to Joseph. Again they bowed their heads low before him. 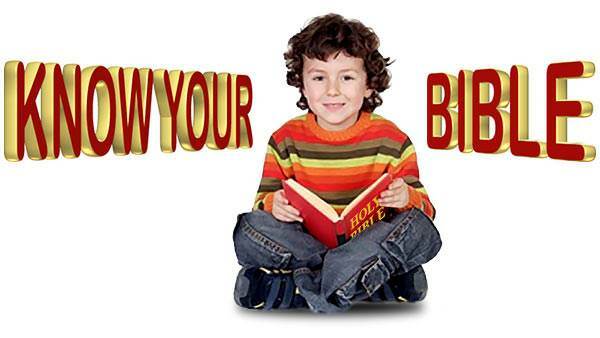 Joseph asked, "Is your father well?" They said, "Our father is well." Joseph saw Benjamin. "Is this your youngest brother?" he said. They said he was. 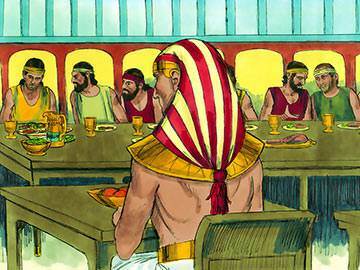 Joseph gave them a splendid dinner. He saw how kind they were to Benjamin and how they loved their old father. By and by he said, "I am Joseph. 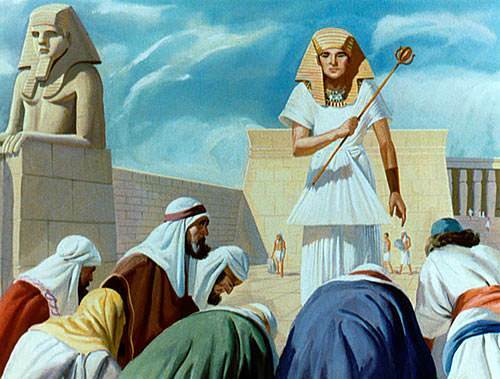 I am Joseph, your brother, whom you sold into Egypt. See! I am Joseph." The brothers could hardly believe that this great man was their brother Joseph. They were frightened. They thought he might punish them. Joseph said, "Do not be unhappy because you sold me. 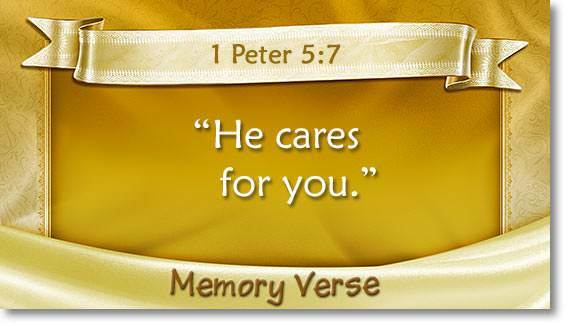 God took care of me. God made everything come out right." Joseph kissed them over and over again. Joseph, the kind brother, said, "Go home and tell my father what a great man I am, and bring him here to live near me. Bring your children and your wives and your sheep and come here to live. I will care for you."